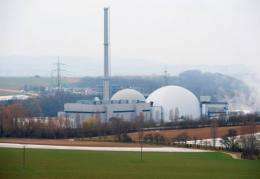 The nuclear power plant Neckarwestheim of power giant EnBW in Neckarwestheim, southern Germany. The European Union will discuss whether to conduct tests on atomic power plants to check their safety in light of the nuclear crisis in Japan. The European Union will discuss Tuesday whether to conduct "stress tests" on atomic power plants to check their safety in light of Japan's nuclear crisis, a European Commission spokeswoman said. The possible tests on nuclear plants will be debated at a meeting of ministers, national nuclear safety chiefs and industry leaders hastily called by EU energy commissioner Guenther Oettinger in Brussels. Oettinger "has indeed said that this is an idea that needs to be considered and it should be debated," his spokeswoman, Marlene Holzner, told a news briefing. "In fact, that will also be one of the topics this afternoon that they will talk about, stress tests for nuclear power plants in Europe," she said. The aim of the meeting is to take stock of safety measures in Europe, home to some 150 reactors in half as many nuclear power plants, in the wake of the earthquake and tsunami that caused a nuclear accident in Japan. However, Austria, a non-nuclear nation, has called for "stress tests" on the facilities, borrowing a term used for the tests conducted on banks to check their ability to withstand financial shocks. Holzner said the European Commission, the EU's executive arm, has "no power to send experts to nuclear plants to see whether they are safe" but can discuss stress tests to see if EU nations would authorise them. In a letter of invitation to the afternoon meeting, Oettinger said the talks would look at operations at European reactors similar to those in Japan, earthquake contingency planning, cooling problems, and evacuation procedures. Japan's nuclear emergency has prompted Germany and Switzerland to halt nuclear programmes with Italy and Poland for the time being suspending plans to sign on to nuclear energy.